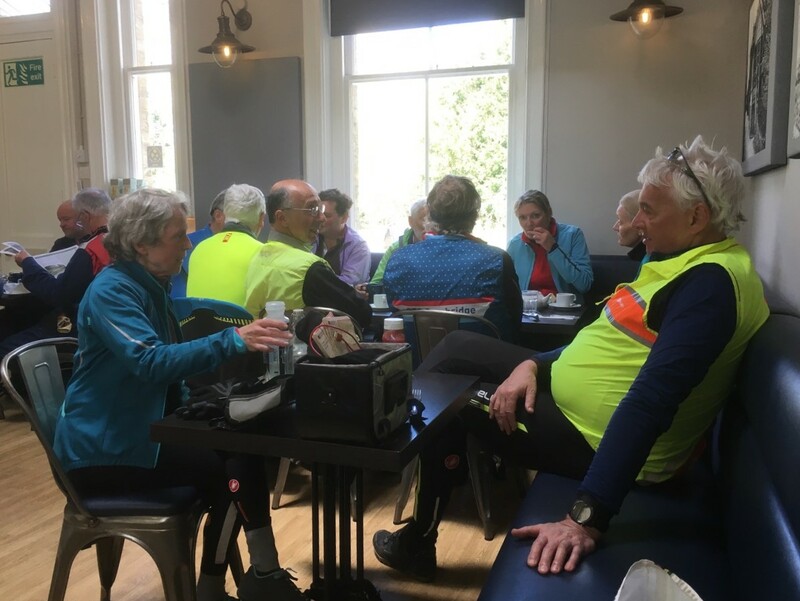 Edward writes: This morning we met for the first time at the Square and Compasses pub in Great Shelford owing to the ongoing works at the recreation ground. First we must give thanks to the landlord who has kindly given his permission for us to use the pub car park. This morning broke bright and sunny, but appearances can be deceptive as there was a brisk and chilly south-east wind which we would have to face for the morning session. 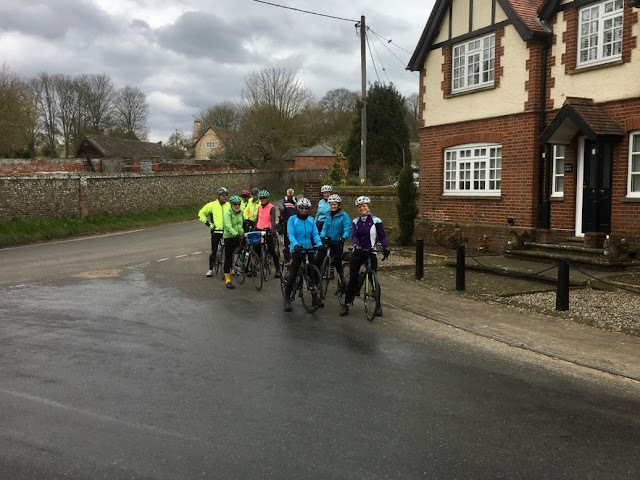 Our trip today, which was led by Sarah, would take us out to Balsham for coffee and Clare for lunch. 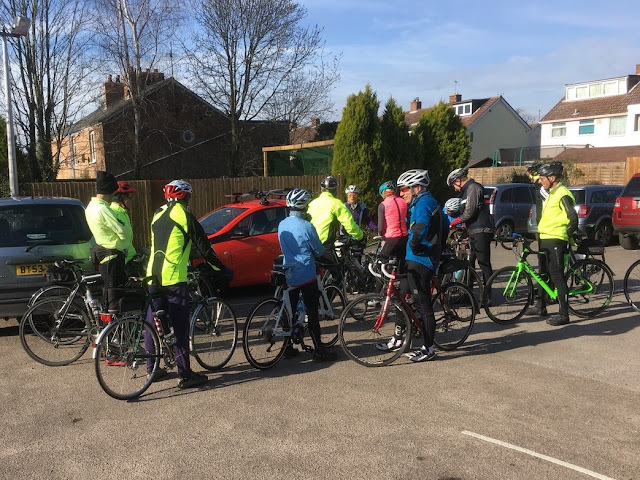 Unexpectedly seventeen riders assembled for this ride - was it the bright sun or the leader's pulling power? Back in the city we heard there were ten or eleven for their ride led by John S.
With so many riders we split into two groups, one led by Sarah and the following group led by her willing assistant. Our route as far as Hildersham was pretty straightforward, going via Whittlesford, Sawston and Babraham, and over the farm into Abington. Once over the A1307 into Hildersham we went along Back Road into Linton and then up Rivey Hill into Balsham and our coffee stop at the Old Butcher's Shop, always a popular venue. When the city and village groups had both arrived there must have been thirty of us, including those who had arrived independently, among them Eva fresh from her trip to Australia. She may have noticed a difference in temperature. The staff in the cafe coped very well with so many, in fact one said she liked the pressure which is good to hear. With Sarah at the helm there would be no dilly-dallying around, and when the call came to assemble for the off we could tell she meant it. Thus it was after about half an hour that we were on our way again. As usual a number turned for home leaving at least twenty to stay the course, but now the wind made it quite hard work. When we turned onto the road from Carlton Green to Little Thurlow it was nice the see the considerable length of new hedgerow which has recently been planted. 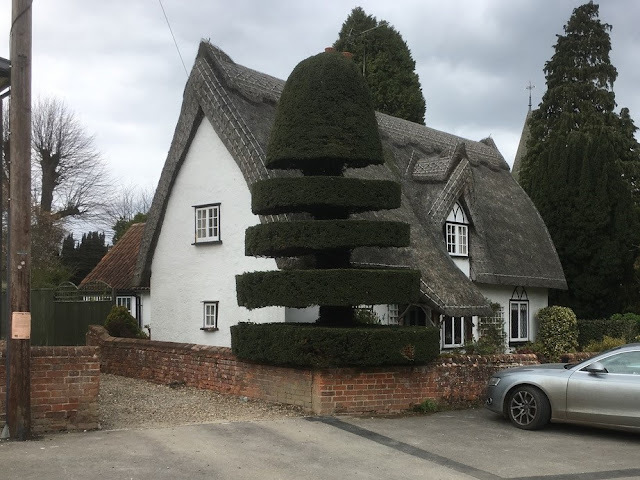 At Little Thurlow we turned though Great Thurlow and Great Wratting and took the narrow country lane up to the B143 for a few hundred meters to the turning to Barnardiston. 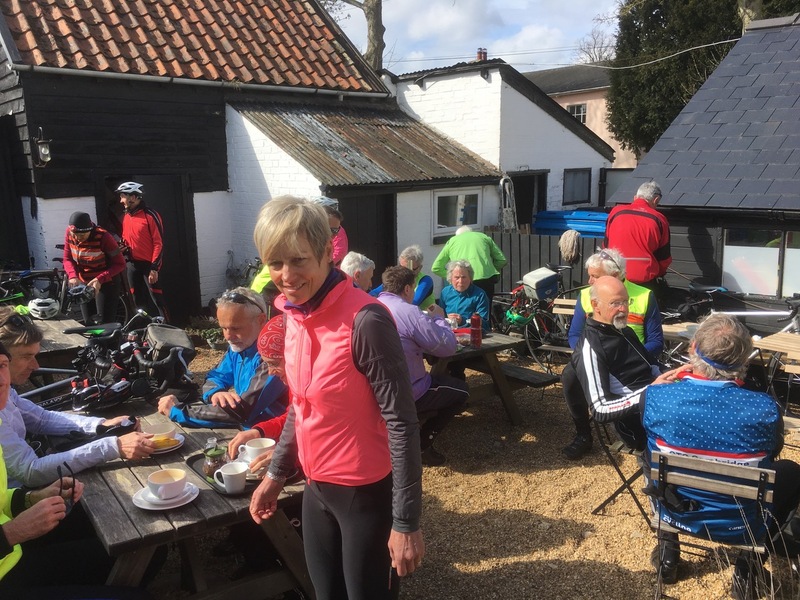 Now the riding was much more peaceful as we cycled through the quiet lanes of the Suffolk countryside via Hundon and finally into Clare and lunch at 12.50pm and 31 miles. About ten or eleven took lunch at the Platform 1 Cafe. Those with sandwiches sat on the benches in the park and Rupert had his usual lunch of fish and chips somewhere in the town. It's interesting to reflect that some fifty years ago we could have caught a train at this former station all the way back to Shelford. That was then and this is now and Sarah gave her five-minute warning and we were on our way again at 1.50pm; twenty riders were counted out - that's some number for an afternoon session. On leaving Clare there are one or two climbs to make but now that south-east wind started to work in our favour and none of the hills seemed particularly arduous. At Ridgewell on the A1017 the city group took a route via Stambourne whereas the village group went along the A1017 for about a mile as far as the turning for Birdbrook. This made a pleasant change, the roads were quiet and with the following wind we made good progress up to the turning for Steeple Bumpstead. Now we were on more familiar roads and they took us through both the Bumpsteads, Castle Camps and Bartlow. 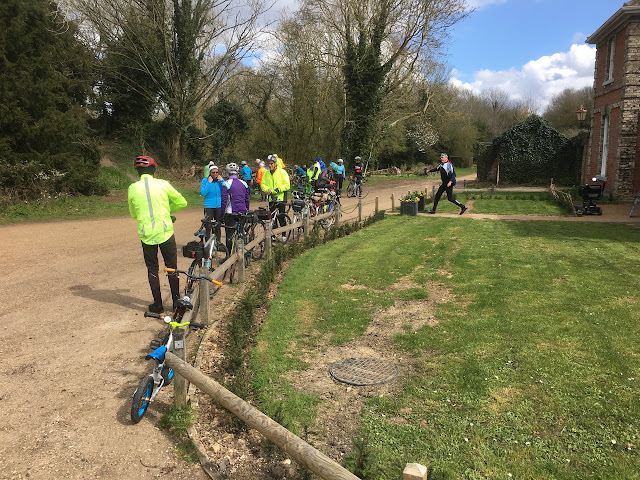 As we paused in Bartlow the city group suddenly appeared, bringing us back to twenty again. Sarah (and Andy) left us here, firmly believing that we could manage the remaining eleven miles back to Shelford on our own. We did manage and we arrived back in Shelford at 4.15pm and 60 miles to the good.